Good Monday afternoon! It was chilly this morning, but the late April sunshine really warmed conditions this afternoon! Highs warmed into the lower 80s in west Alabama. Expect temperatures to drop into the middle 50s overnight, under a clear sky. Upper level ridging will really build into the area on Tuesday and Wednesday. This will allow temperatures to warm into the middle 80s both on Tuesday and Wednesday, under a mostly sunny sky. Expect upper 80s on Thursday and Friday, as a summer-like airmass arrives. By Friday and over the weekend, I can’t rule out an isolated shower or two during the afternoon, as moisture increases and heights decrease a bit. Expect a partly cloudy weekend, with a high in the lower 80s. No tricks from the weather this week! Sunny and warmer days are in store for us in northern Alabama. High pressure has settled over the southeast and will prevent any cloud cover till Thursday. Temperatures will start to climb up into the mid 80s, with Wednesday and Thursday being the warmest. Overall, for the next 4 days expect clear and sunny skies over our region! By Friday we still stay warm but a few scattered showers along with cloudy skies will be possible, and those conditions will last into the weekend. A perfect week is in store for us and most of northern Alabama! Starting on Sunday we will see a warming trend come into play. Temperatures will be in the lower to mid 80s throughout the week. Plenty of sunshine will be around with very little cloud cover. Humidity levels will be on the rise towards mid-week but skies will remain clear till the weekend where a few clouds with possible rain showers will re-enter the forecast. Until then, the weather will be perfect and very spring like for most of this week! It was 7 years ago today, when a horrible tornado outbreak changed my life. It’s a day that affected so many people on so many ways. Not only did a powerful tornado hit the city of Tuscaloosa, Alberta City and Holt, but 62 tornadoes tracked across the state. Many people lost their home, including myself. I lived in a neighborhood behind Big Lots and Hobby Lobby. I was so fortunate because I survived the storm, and so did all of my close friends and family. Numerous friends of mine did lose their home or apartment, but they made it out with their life, and that’s what’s most important in the end. The days leading up to the big outbreak were more than concerning, they were downright frightening. We had a dangerous squall line move through that morning, which left many without power. When the sun came out early that morning, many folks though the severe weather was over, but the worst was yet to come. The sun added to the instability. The instability was a disastrous ingredient thrown into strong wind shear. Shear and instability are the ingredients that aren’t good to have together. Every storm was producing large tornadoes, and the chance of tornadoes in one area was higher than I’ve ever seen before. Since the Tuscaloosa/Birmingham tornado affected me personally, I’ll focus on that tornado. Understand, there were 62 tornadoes that day that led to the largest single day tornado outbreak in Alabama’s history and nearly the most deadly. So many people were affected outside the large cities, in small towns scattered across the state. The first tornado of the afternoon round hit downtown Cullman just after 3pm. After seeing video and hearing reports of what just happened in that area, Daniel Sparkman and I knew this really was going to be as bad as expected. A small supercell storm had just produced a large tornado in a large town; it was a disaster already. After the tornado hit and we and lost power, I knew we had no way to broadcast on television. My main concern was getting to my house, where my roommate and WVUA Director, Jonathan Newman, was at the time. I had no idea what to expect, but I feared the worst. I parked my truck on the side of McFarland BLVD less than 10 minutes after the tornado hit. Rescue personal wasn’t even on the scene just yet. The sound of store and car alarms and police sirens filled the air. The smell of mud, tree sap and natural gas was so strong, it would nearly choke you. The sight of people climbing out of a pile of wood and brick was a sight I’ll never forget. When I got to my house, Jonathan was standing in the front yard. I was so relieved when I saw he was ok and so were my neighbors. Some of my neighbors had injuries, but they were not life-threatening. Unfortunately, that was a different story only 200 yards away, where several people didn’t survive the storm. More than 50 people died in Tuscaloosa alone and over 250 people died in the state of Alabama, making it one of the most deadly tornado outbreaks in US and state history. 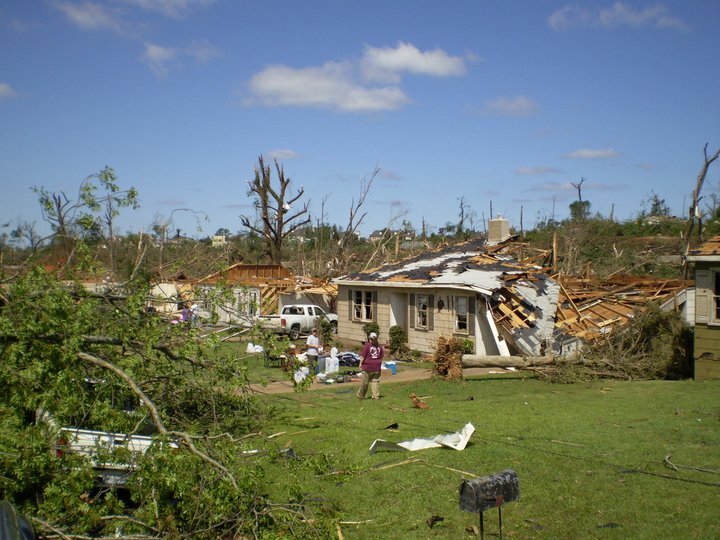 Below is a picture of my house the day after the tornado hit. This event changed my life, and I’ll never look at storms the same way. Severe weather will continue to happen at times, and that’s a part of life we will have to live with. I don’t think we will ever see an event nearly the magnitude of this one. It only takes one tornado, so please take every warning serious. 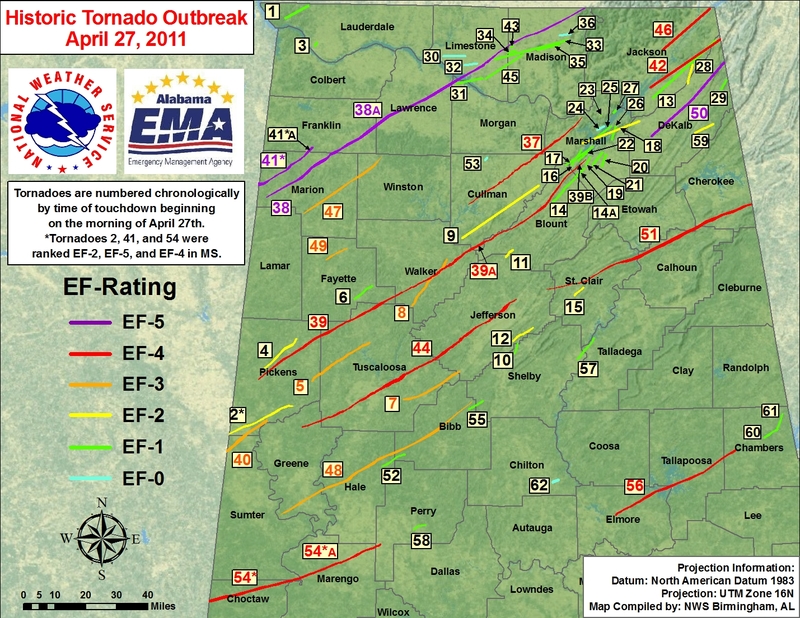 Above is a map across our area that shows the tornado tracks and ratings on April 27th. This map tells a big story! Good Thursday afternoon! We had a big soaking rain event early this morning, as a wave of low pressure moves eastward across the state. The main rain ended for all of central Alabama by mid morning, but lingering showers continue, especially for northern Alabama. The risk of showers will come to an end this evening and tonight, with temperatures dropping into the 50s overnight. Look for a low near 50. Friday will feature a nice day, with a return of some sunshine. I expect a few passing clouds, but we’ll see more sun than cloud cover. Highs will warm into the middle 70s by mid afternoon. Dry and sunny weather will continue this weekend, with temperatures in the 70s on Saturday and on Sunday! This is race weekend at Talladega, so the weather couldn’t be better for this weekend. Temperatures at night will remain rather cool, with upper 40s to near 50 both Saturday night and Sunday night. Next week, we’ll really warm, as upper air ridging builds in from the southeast. Highs will reach the 80s on Monday and we could even see a few mid 80 degree readings on Wednesday and Thursday. Good Wednesday afternoon! Our local weather has turned out nice today, with a partly cloudy sky and mild temperatures. Most areas made it well into the 70s, with a few upper 70s over west Alabama. Expect an increase in clouds tonight, as a weak surface low and sharp upper air trough axis swings in from the west. Rain will become widespread over west Alabama sometime after 3am, then spread east to include the rest of central and east Alabama during the mid morning hours. Rain amounts will reach 1/2 to 1″ for Thursday, with the more widespread rain happening from 3am to noon on Thursday, then scattered showers during the afternoon. Temperatures will top out in the upper 60s Thursday afternoon. Dry and sunny weather will arrive this weekend, with temperatures in the 70s on Saturday and on Sunday! This is race weekend at Talladega, so the weather couldn’t be better for this weekend. Good Tuesday afternoon! We’ve got a mix of sun and clouds this afternoon across the area, with a few isolated showers drifting southeast across the area. The isolated showers will dry up this evening as the sun sets and temperatures will cool into the lower 50s overnight. Drier air will move in on Wednesday. We’ll see a partly cloudy sky, with afternoon temperatures in the middle 70s. A weak upper level disturbance will move through on Thursday, with a wave of rain spreading into the area. Rain amounts will reach 1/2 to 1″ for Thursday, with the more widespread rain happening from 3am to noon on Thursday, then scattered showers during the afternoon. Dry and sunny weather will arrive this weekend, with temperatures in the 70s on Saturday and 80s on Sunday!